Sine.space by Sine Wave Entertainment is a multi-user virtual world based on Unity3D. A previous blog post showed early experiments while the system was in test mode in 2015. The platform is now available to all, and users can add one free “region” using an addon Unity3D “unitypackage” merged with custom content. Other tests of Sine.space for Gerry Anderson’s Black Rock Laboratory (Supercar) and Space City (Fireball XL5) regions, RGU Oil Rig, the Space Station from the movie 2001, and NASA International Space Station (ISS) are in separate posts. These are not publicly accessible and are mounted on development servers for testing only. Sine Space Region Pricing (also see the “Subscribe” link while logged into https://curator.sine.space/ as a “content creator”). Vue is taking out a “Standard 3” package for 2017-2018. 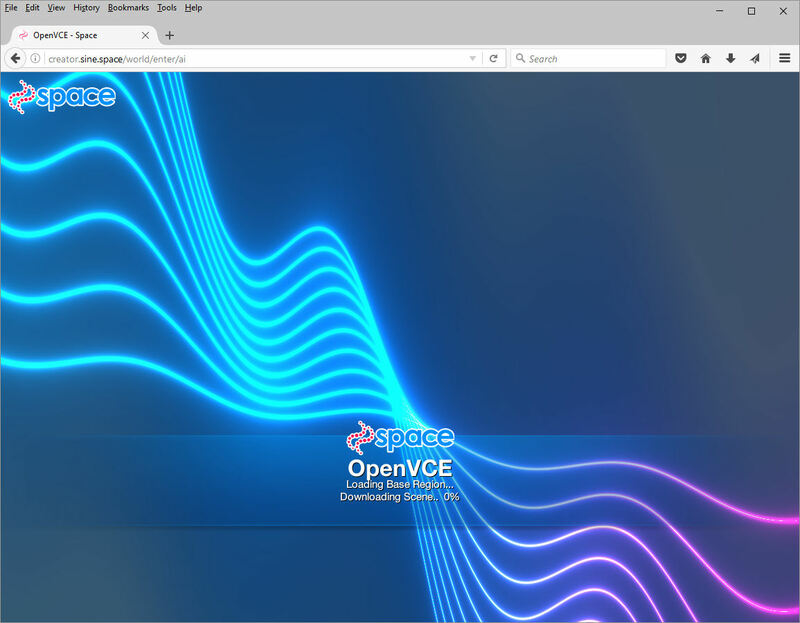 Sine.space regions can be accessed via a WebGL capable browser such as Mozilla Firefox or Google Chrome, or via an installable desktop application (download via link at http://sine.space). An avatar can be moved using the usual WASD or arrow keys, and F(ly) mode can be toggled with “F” and then the E and C keys move the avatar up and down (Page Up and Page Down as alternatives may be added soon. Update: available now). It may be worth noting that Alt+U toggles the interface elements on and off in the viewers, if you want a clear image for snapshots. Previews and testing is done in http://curator.sine.space and live regions are served via http://creator.sine.space. There is a limit of 128MB on the download size of a region on the live server for the free account. Larger region downloads are available via paid subscriptions on the sine.space platform. The region size is reported when a region is uploaded from Unity3D to the review “curator” server so you can see if it will be within the size allowed for free or paid accounts..
A test of adding a region into sine.space was done using the OpenSimulator OpenVCE region converted via OARConv tool to Collada meshes suitable for import to Unity3D (see this blog post for details of that conversion). Register a sine.space user as a space developer “creator” (http://sine.space/creator/) to get access to the relevant SDK and Unity3D package required. You need to create a Unity3D application incorporating the sine.space Editor unitypackage available via a link accessible only to registered and logged in creators at https://sine.space/creator/resources/ (EditorPack-08p1.unitypackage as at 15-Nov-2016). Instructions for the process involved can be found in these two YouTube videos. Load in the sine.space Editor unitypackage (EditorPack-08p1.unitypackage as at 15-Nov-2016) using Assets -> Import Package -> Custom Package. This adds an extra menu item to the Unity3D editor menus – “Space”. Use Space -> “Install Editor Pack Settings” and then Scene -> “Scene Settings”. This will add a “Scene Export Settings” item to your Unity3D project. Click on that and set fields appropriately. The content type will be “Region”. Give it a name. You can “reserve” a URL for the region for when it goes “live”. Make sure you have some sort of ground plane which has collisions set so avatars do not fall through the floor. This can be removed when your region content is added if that incorporates its own ground terrain or floor. 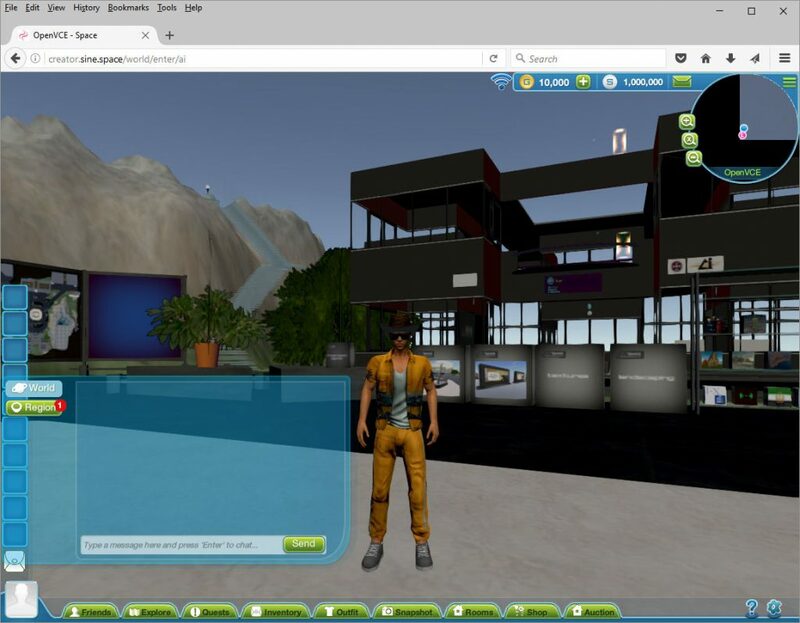 Add the sine.space provided “PlayerChar” (a blue male avatar) to allow local testing of the region in the Unity3D editor. Add a sine.space “Landmark” to act as the spawn point when avatars enter the region in sine.space. In the project hierarchy use Create -> Create Other -> Landmark. Then select that object and tick it as ‘Spawnpoint’ and select its Type as ‘Landing Zone’. Place it so that its baseline is a metre or so above the ground level. So when avatars spawn their feet are definitely above the ground plane and fall gently onto it. Remove the Main Camera as that will interfere with the “PlayerChar” avatar or live avatars when the region is used in sine.space. [OPTIONAL] In the Unity3D editor Window -> Lighting settings swap the Ambient Source from Skybox to Gradient, and raise Ambient Intensity from 1.0 to 1.75 to prevent over harsh shadows and lighting. If you want WYSIWYG between Unity3D editor and sine.space creator make sure Linear lighting is on via Edit -> Project Settings -> Player, under “Color Settings” there is an entry for Color Space – make sure it’s set to also Linear, not Gamma. Save this setup as a Unity3D scene and save the Unity3D project as a base for future region creation. Now you can add your own region content into the project, testing it with the incorporated temporary “PlayerChar” to walk around it. Lighting was a bit harsh when the OpenVCE region was first tested as the region content. Adam Frisby at Sine Wave Entertainment suggested to use Unity3D editor Window -> Lighting settings to swap the Ambient Source from Skybox to Gradient, and raise Ambient Intensity from 1.0 to 1.75. He also found a specific issue with a shader on the “Tweet Bubble” object, which was subsequently removed in the Unity3D project. If you want WYSIWYG between Unity3D editor and sine.space creator make sure to switch to Linear lighting too via Edit -> Project Settings -> Player, under “Color Settings” there is an entry for Color Space – make sure it’s set to Linear, not Gamma. 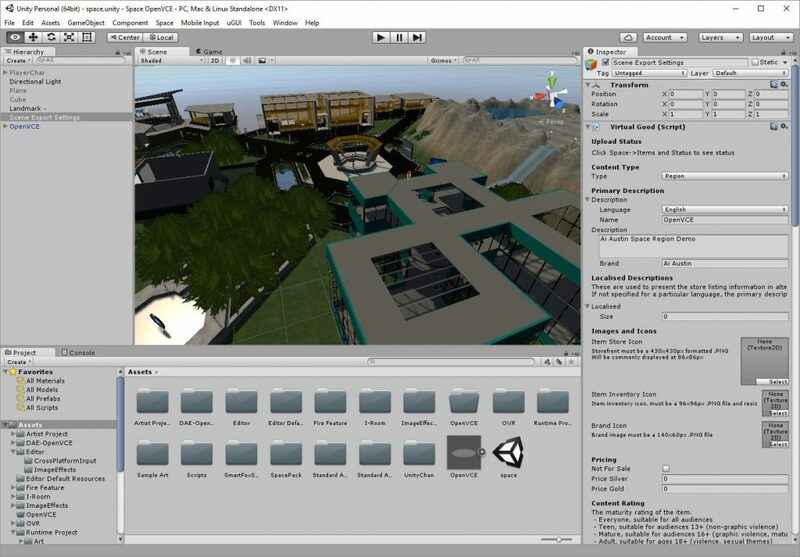 You might want to make a fresh Unity3D scene into which these changes can be made, prior to upload, so your base project and content remains intact for continued revision and testing in the Unity3D editor afterwards. Remove the PlayerChar character from the Unity3D project inventory before uploading the region to sine.space servers. 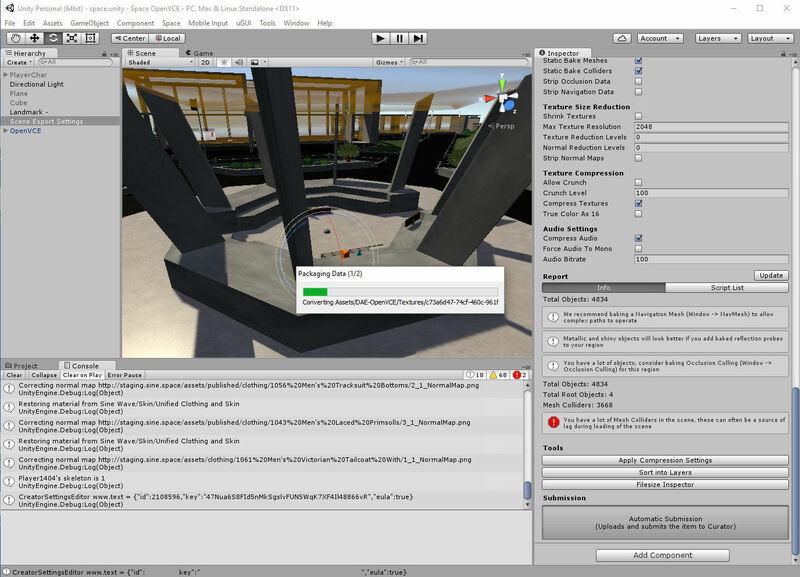 Note that just unticking the box which shows the PlayerChar in the project is not enough as hidden objects are still included in the final result. This is because components can activate hidden objects via scripts, etc. Add into the project hierarchy a new empty game object and name it something like “Space Post Zone”. Open it in the Inspector and add a component called “Post Zone”. This gives many options for settings that will be applied to your region and how it is rendered. In here, for example, you can turn off depth of field blur with a tickbox. These are only applied on sine space servers not locally in Unity3D editor player, and may cause errors there. Check the “Scene Export Settings” settings to ensure the content type is “Region” to check the region name, URI and other details are correct, etc. Most defaults for the various settings should work for testing purposes. You can add in the custom icons, etc if you wish, or test without these. Login via the Unity3D editor Space -> Upload Settings” to allow for the upload to take place. This will fill in your API key which you should have previously created via https://curator.sine.space/. Scroll down to the bottom of the “Scene Export Settings” in the Inspector and you will see the button for “Automatic Submission”. Hit this to begin the region packing and upload process. The OpenVCE region, unoptimised and with all the OpenSimulator region content intact was reporting a 226.24MB size. In the “Scene Export Settings” settings, this can be optimised, especially for texture quality. WebGL has a smaller download size as its textures are less detailed. The “Standalone” size is larger by default as it uses higher quality settings. Try adjusting these to change the download file size that will be required. E.g. I changed the max texture size to 512 from 2048 for the standalone. make sure you hit the “Apply Compression Settings” button under Tools in the “Scene Export Settings”. You can also remove objects from the project. You must really delete them from the Unity3D project hierarchy since just unticking the box which shows the object in the project is not enough as hidden objects are still included in the final result. This is because components can activate hidden objects via scripts, etc. A suggestion might be to create a new Unity3D scene from the full project and only delete the PlayerChar and unwanted items in that scene. Advice from Sine.space developers to reduce texture size in region downloads was to use the “Scene Export Settings” “Texture Compression” section. Allow Crunch and set the Crunch Level to 50 (100 is lossless, 0 is maximum compression). Look in Standard Assets -> Environment -> Water -> Prefabs… and add WaterProDaytime set at 0,0,0 and scaled to 300,1,300 (to extend beyond a 256mx256m OpenSim region). Then also add WaterProNightime set at 0,0,0, rotated to flip it upside down to act as a surface water layer when viewed from underneath 180,0,0 and also scaled 300,1,300. For each type of water make the Water Mode be “Simple” rather than the default “Refractive” or the other “Reflective” option, as that will look better in the various Sine.space viewers. Script: “Seat Improved” Note: Even though the pose doesn’t work in Unity3D editor play mode currently it is being displayed as a green avatar in edit mode and will work after being uploaded to sine.space servers. 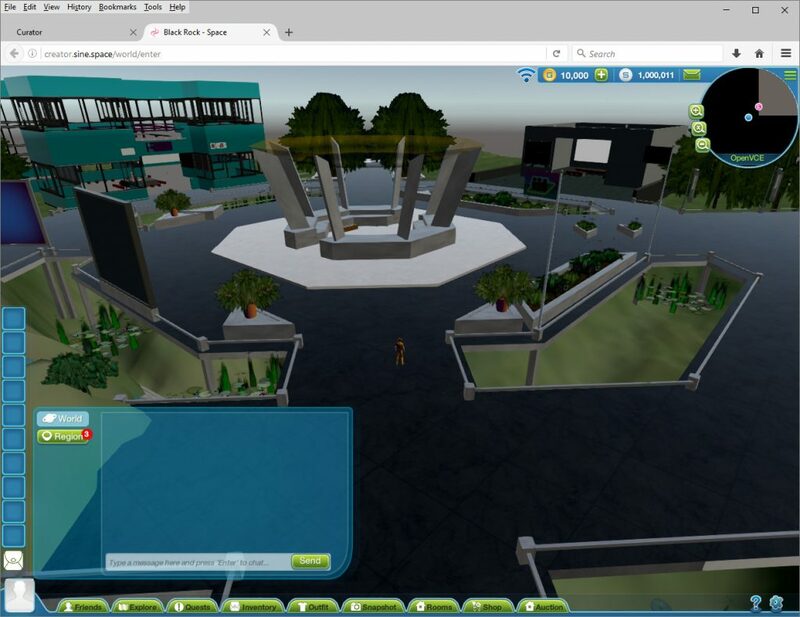 This entry was posted in Virtual World and tagged OpenVCE, Sinewave, Unity3D, Virtual World. Bookmark the permalink. The default shader used for OpenSim plants converted via OAR Converter for Unity3D is a legacy shader -> Cutout -> Soft Edges. The tree textures though show partially transparent in the Windows client. Adam Frisby, a Sine.Space developer, provided an unsupported C# script utility to seek to remove duplicated textures which make an OARConv import to Unity larger than necessary… due to the fact that texture/material properties of an object or face are encoded into multiple repeated texture file names by OARConv. This comes 100% unsupported, but I wrote a tool to clean the materials that the OAR Converter tool produces. It de-duplicates textures, which I’m hearing produces good results on cutting the filesizes of those regions. It just MD5Sums the files, if they match, it merges them. Drop that into a folder named ‘Editor’ in your project (any folder as long as the name is ‘Editor’). Then you should get a Space/Tools/OAR Material Cleanup menu item. This is used AFTER the OAR converted contents have been loaded and the materials created. It just standardises the materials that use copies of the same texture so they all use one single texture, thus reducing the file size of a Sine.space build. When you run it (again, 100% unsupported, take backups! although I hear it works) – will remove all the duplicates in your region.